Last week was hard, kittens. Sleep deprived, having to cover for coworkers out of the office, training replacement, too many projects, borderline cold that never materialized hard. I was not sorry to limp out of the office Friday. Luckily I had brunch on Saturday with Jane and a phone call with Peregrine to set me up cheerful again and I took Sunday off to just relax – something, it turns out I’m really bad at doing. Comically bad. 20 days left at the PD. Four weeks from today is my last. My trainee is flying my desk so I’ve taken up residence in a corner of the front counter with my laptop (lugged from home every morning) and tea. It’s uncomfortable and requires a bit of contortion, but I’m pretty chipper (see again: 20 days). We’re starting to gear up for selling our possessions right from underneath ourselves. Local minions, or those who know anyone looking locally, in need of some household goods/furniture, let me know. Family portraits this week for J.’s side. Which is substantially larger than mine and looks to be a major production! All of his siblings and their children will be in town, which will be fun since his whole clan doesn’t get together too often. Things I shall not miss about the PD – being told to take lunch breaks and to not worry about assisting patrons when I’m clocked out (even if no one else is available), only to be reprimanded for not being available to assist a patron because I’d clocked out for a lunch break. Le sigh. The babies on either side of us are still wailing nightly. Reasons to look forward to moving out. This may or may not be factual. Moving sounds like the perfect plan. 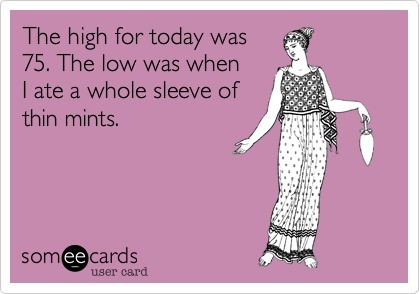 Eating a whole sleeve of Thin Mints is *never* a low, whatever else happens. I concur. But some tend to look askance when one is quietly devouring said sleeve in a corner and think the worst.